Officials with the Cuban Foreign Trade and Investment Ministry and a Vietnamese delegation will assess working plans agreed to in previous sessions of the Cooperation Commission and will draw up new actions, according to organizers of the event, which winds up on Tuesday. Both parties signed economic and scientific cooperation agreements in 2010 in key economic sectors, such as agriculture, trade, biotechnology, construction and the electronic industry. On Monday, Cuban and Vietnamese entrepreneurs will hold a business meeting to explore new opportunities in the areas of tourism and construction. Directives with the Cuban Chamber of Commerce and the Construction Ministry will exchange views with their Vietnamese counterparts during a gathering at Havana’s Hotel Nacional. 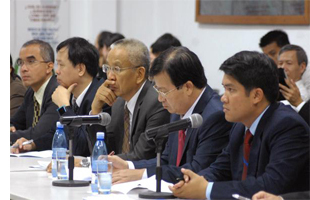 The 5th Joint Business Forum, held in Havana in June 2011, revealed that Vietnam is Cuba’s second commercial partner in Asia and Oceania, according to Opciones business magazine. During that forum, the representatives of both countries signed a Plan of Action and a Cooperation Accord to renew a previous one penned in 1999. Vietnam is Cuba’s major provider of rice, while the Asian country continues to increase computer equipment exports to the island, which contributes to the education and cultural preparation of the population, said the vice-president of the Cuban Chamber of Commerce Odalys Seijo.